It wouldn’t be false to declare WhatsApp as the Primary Mode to Communicate now a days. Due to the heavy demand and popularity of this messaging app, the developers of WhatsApp are releasing the app updates at very frequent rate. Recently, the WhatsApp developers included the most demanded features to format / decorate the message text in WhatsApp. WhatsApp is at this height due to its Simplicity and Easy User Interface. Like other features in the WhatsApp, this newly introduced text formating / decorating feature is very simple to implement on the messaging text. Without wasting any more precious time, Let’s move forward to the howto section about typing Bold, Italic and Strikethrough Text in WhatsApp Messaging. How to type WhatsApp message text in Bold, Italic, and Strikethrough on Android / iPhone Device. To obtain more reader’s attention, certain part of the WhatsApp message text has to be highlighted. Earlier we don’t have any way to go, but introduction of these new text decoration / formatting options has added a new dimension to this no 1 messaging app of the globe, WhatsApp. Using this new feature you can easily make the WhatsApp content viral. 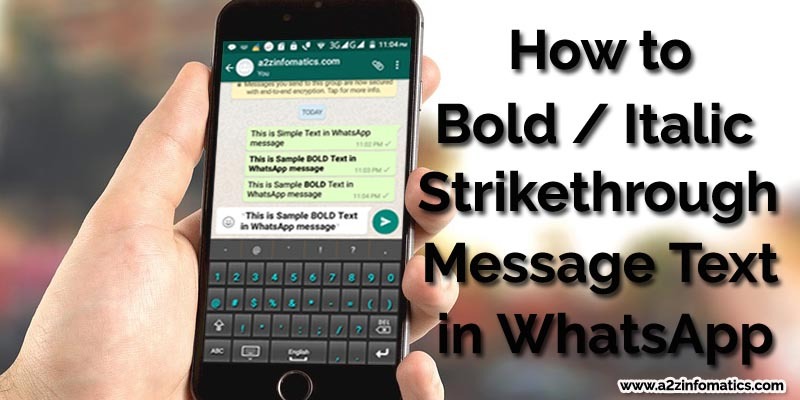 Below are the detailed easy step to type WhatsApp message text in Bold, Italic, and Strikethrough. 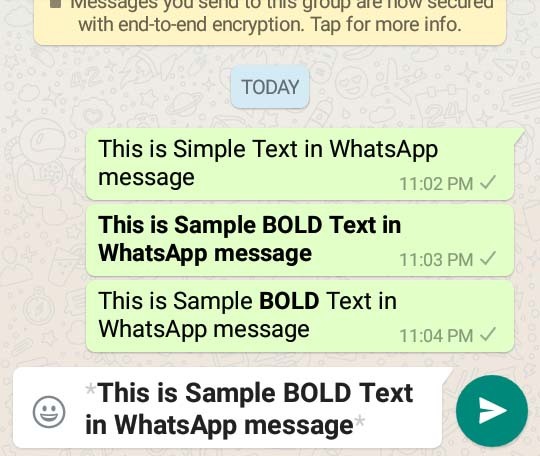 How to type WhatsApp message text in BOLD on any Android / iPhone Device. Open / Launch the WhatsApp, select any friend / group to whom you want to send the message / text using the BOLD text feature of WhatsApp. To implement the Bold Formatting to the message or any specific piece of text, Just place the “*“ (asterisk) sign / symbol before & after the Message OR to any specific piece of text. *This is Sample BOLD Text in WhatsApp message. * (Complete message will be decorated as BOLD). This is Sample specific piece of *BOLD Text* in WhatsApp message. (Only the text “BOLD Text” will be decorated as BOLD). 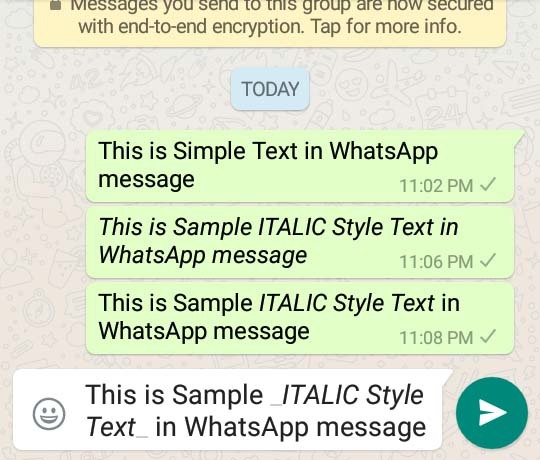 How to type WhatsApp message text in ITALIC Style on any Android / iPhone Device. Open / Launch the WhatsApp, select any friend / group to whom you want to send the message / text using the ITALIC Style text feature of WhatsApp. To implement the ITALIC Style Formatting to the message or any specific piece of text, Just place the “_“ (underscore) sign / symbol before & after the Message OR to any specific piece of text. _This is Sample ITALIC Style Text in WhatsApp message._ (Complete message will decorate in ITALIC Style). This is Sample specific piece of _ITALIC Style Text_ in WhatsApp message. (Only the text “ITALIC Style Text” will decorate in ITALIC Style). 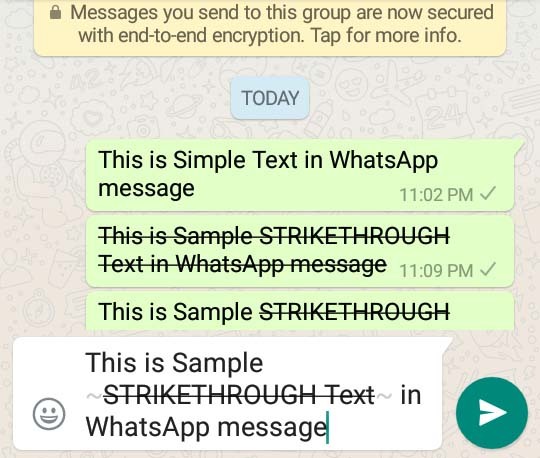 How to type WhatsApp message text in STRIKETHROUGH on any Android / iPhone Device. Open / Launch the WhatsApp, select any friend / group to whom you want to send the message / text using the STRIKETHROUGH text feature of WhatsApp. To implement the STRIKETHROUGH Formatting to the message or any specific piece of text, Just place the “~” (tilde) sign / symbol before & after the Message OR to any specific piece of text. ~This is Sample STRIKETHROUGH Text in WhatsApp message.~ (Complete message will be decorated as STRIKETHROUGH). This is Sample specific piece of ~STRIKETHROUGH Text~ in WhatsApp message. (Only the text “STRIKETHROUGH Text” will be decorated as STRIKETHROUGH). Important: Typographical representation of the character / words with a line horizontally passing through their centre is called Strikethrough. It’s generally used under the situations where we wants to edit something already written, without deleting the original text. In addition nobody can disable any of the above text formatting features. You may Like: How to Open WhatsApp Obsolete / Outdated Version. You will surely Like: How to use Secret FixedSys font in WhatsApp without any third party services. If we talk about available Font options in the WhatsApp, there are not many. By default, user can only select the size / weight of the font like small, medium or large. Off Course, you can format / style the text in any of your desired font using the third party services. You can easily found these third party text services to decorate WhatsApp text by simple google search, they will just request you to provide the text and the font name you wish to decorate the text with. After processing the input data, they will generate and provide you the code, which you have to paste into the WhatsApp text / message box. To tell you the truth, this will never prove useful to anybody who loves the instant chat / discussion. People from advertising / marketing arena may found this useful to obtain more reader’s attentionas on the targeted stuff. That’s all for now. Suggestions are always invited from our valued readers. You can place the same under the comments section below. We will try our level best to update the stuff accordingly. At last, thanks for your valuable time, do subscribe our BLOG to get the latest updates direct to your mailbox.